Workstations are essential and used in the daily operation of any business or enterprise. Whether they are desktops or laptops, JR-Tech will have the solution necessary for your business. Each department and locale uses workstations differently and requires different solutions, which is why workstation solutions provided by JR-Tech are personalized and customized for each use where ever they are needed. If you are on the road or sitting in a cubicle, the workstations used, need to perform optimally to be most productive and efficient. In the design of a network infrastructure, the workstation is the final section of the design and is what the user will operate in the normal day to day functions. Therefore the workstation needs to be able to perform efficiently to provide an ease of use for any and all users. 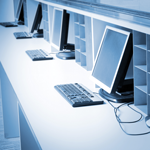 If you are installing new workstations or upgrading your out-of-date workstations, JR-Tech will provide the finest and most reliable workstations that your business will require.